Mamahood, Among Other Things...: Boy Time! Oops! I'd missed a post last week. I knew that. By Friday, two days when I should have posted. Story of my life these couple of weeks. Little Miss Z had some of friends over a couple of weeks back. Five lovely little ladies (given to giddiness and giggles); all had a wonderful time. I thought it's time that J has some of his friends over, too. He got invited to a couple of play dates on the same day, so I thought that we should just host one and invite the other two boys (plus one more) over instead. I'd have loved to invite more, but I needed to be mindful of the dynamics (and my sanity!) and decided to play it safe instead. Plenty of time to arrange something with the other boys. They had a bit of fun with their electronic devices, then moved on to some magic tricks, a board game (Carcassonne). After lunch, they had some fun in the pool, in the hot tub. Popped back in for popcorn, then back out again for two rounds of bowling. All in all, a nice, fun time for all (I got to bowl with them!). Happy to have these three boys over any time. Love that they are entertaining themselves without electronic devices! Sounds like a fun afternoon! I love that game. Sounds like they all had a fun time! 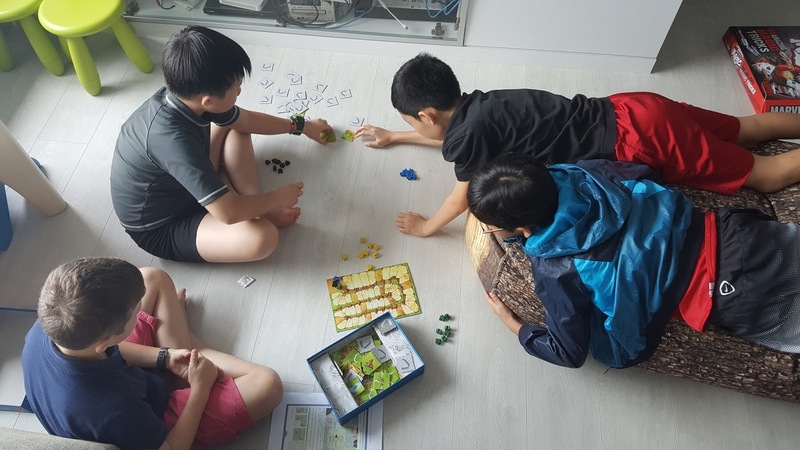 it is great to get our youngsters off their digital devices and out into the yard to play, or playing a board game. Have a fabulous week. Board games are always fun. It sounds like they had a great time. I feel a bit like Amy Franks... it seems like ages since the kids were at this stage. I am so happy you are cherishing it. Happy Mother's Day... a little early.